Last Friday I taught a class how to do a Somerset Star at the request of one of the Chertsey Museum ladies: all very well but I had to find out how to make it! I Googled it, and a few 'recipes' came up, but they seems to all use different methods, so I took the simplest bits from each one, and thought I'd share it with you here. 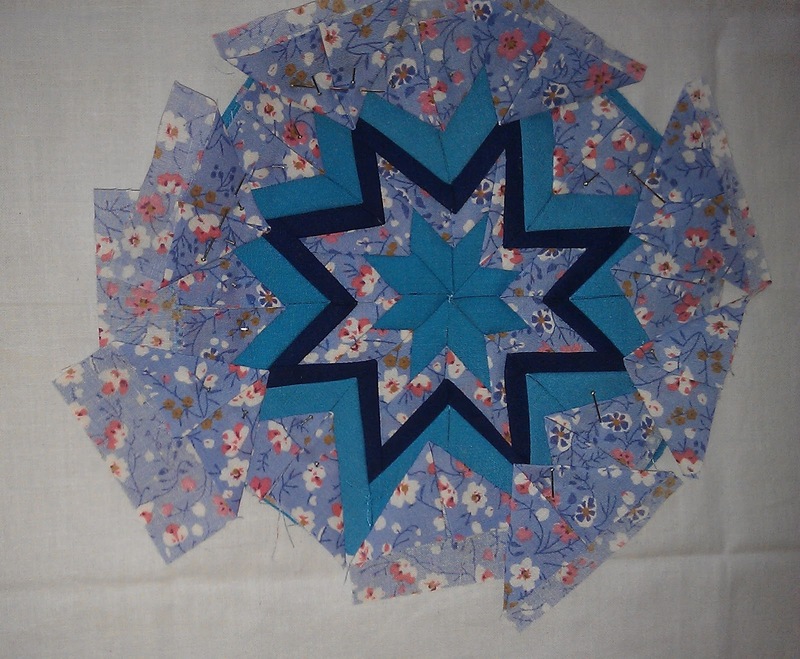 It seems to be called Somerset Block, and Folder Star, but as fan of alliteration, I have gone for Somerset Star! I then carefully cut four 5x5 squares, and pressed them first in half, then into triangles by folding the fold into the middle (did you ever make a hat or a boat from a sheet of newspaper?). 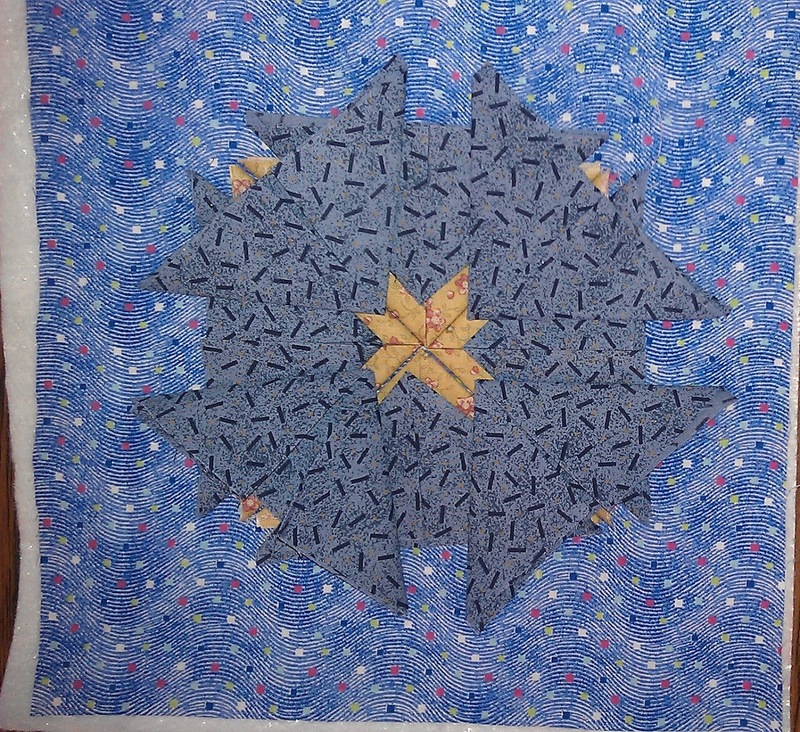 I arranged these in the middle using the horizontal and vertical folds (+) in the background fabric to help align them, and I stitched them down along the outer edge. Then I cut eight squares in a new fabric, again 5x5 inches, again the folding and pressing. 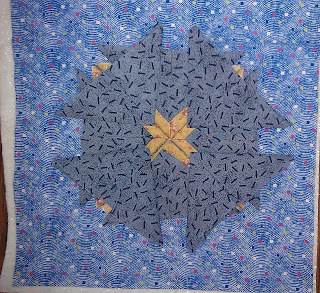 Next I carefully measured 1/2 inch from the centre, and place 4 triangles on the + lines, and the other 4 using the diagonal (x) lines, and stitched down near to the raw edge. For the 5th round, some internet examples arrange 16 folded triangles - the normal 8 and then the others in between them - try placing them and see if you like them. Now you have pretty much finished this bit. If you want to make a cushion cover, use the stitch and flip method to cover the seams and bulk out to the size you need. If you want to make a pot mat, add a layer of wadding, and a layer of insulbrite (? 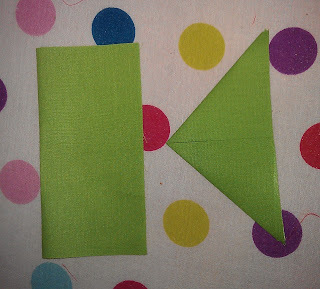 ), then backing fabric, and bind. 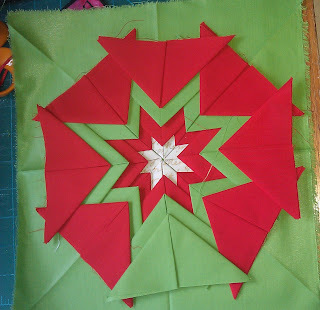 I haven't included stitching down the points. I really like the 'monsters mouth' effect of leaving them free, but don't think it would go well in the washing machine, so the recommended method is to stitch each point down at each stage. Just telling you! That made my brain hurt - but they look good! Wow! What a fantastic block, Benta! Glad your class went well. This looks great. I agree it's nicer not to sew down the points I think the mouths are what give them their character.